If your jewelry website does not have the RingBuilder® on it yet, you are missing out on an important online tool that can improve your user experience and make your online engagement more interactive. RingBuilder® is an excellent tool that can help your customers personalize their shopping experience, while improving your company’s overall sales. Customers receive a personalized shopping experience. Whether on your website or through your company’s Facebook page, your customers can design their own engagement rings, allowing them to create the perfect ring they're looking for. Customers who feel like they are creating their ideal ring will feel more confident when purchasing from you, since they've had first-hand input into the entire design process. Showcase loose diamonds and mountings from select vendors on your website. 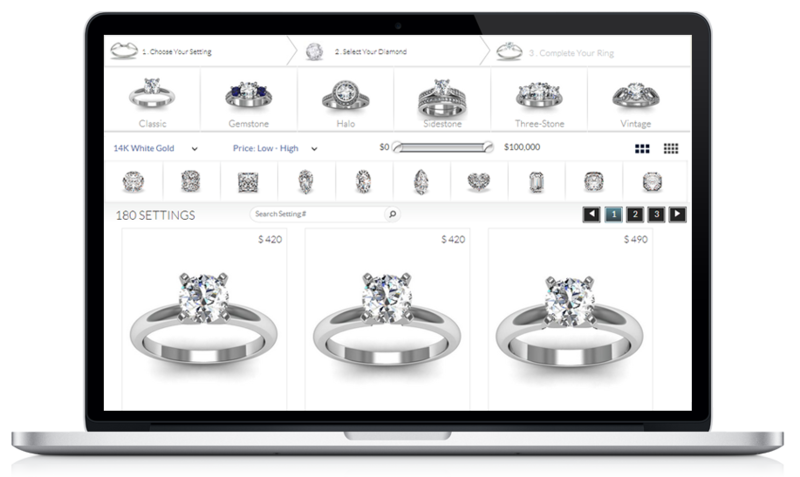 RingBuilder® allows you to showcase Mountings from JewelCloud vendors such as Overnight Mountings, Artcarved, Tacori as well as over 50 diamond suppliers and automatically update the prices on your website, ensuring that the appropriate cost are shown. This eliminates the hassle of manually going through the different products to upload and maintaining the prices on your website. Easy to integrate with your website’s shopping cart. If your company sells rings online, RingBuilder® can easily be integrated with your shopping cart, allowing customers to shop for and buy the custom rings all in one location. GemFind's developers and support team are also available to assist you with the integration, so that the whole process goes smoothly. You can customize RingBuilder® to match your website as well as your inventory. For the ultimate customer experience, RingBuilder® does not need to look like it is a tool that is separate from your website. Instead, it can look like it was built along with your website, so that the user interface will have consistency. Attract more customers to your website and to your store. By offering your customers the ability to build the perfect ring, customers can make inquiries through the builder itself and further drive customers to physically going to your store to purchase the ring. Allowing customers to first narrow down the type of engagement ring that they are shopping for, will turn them into more confident consumers and can create repeat customers. GemFind built the RingBuilder® with the hope of providing jewelry retailers and vendors a tool that can help them to efficiently manage their jewelry inventory, as well as allow their customers to have the chance to design their own rings online. GemFind has been a trusted presence in the jewelry industry since 1999, due to the reliable and innovative marketing and technology solutions. We can help jewelry retailers connect with their customers and build their businesses. With the extensive knowledge of the needs of retailers, designers and manufacturers and diamond dealers, GemFind is aware of the various needs within the jewelry industry, and committed to helping the jewelry industry to be successful.